Crags Adventures have been rated the No.1 outdoor activity company in the whole of the English Lake District by our customers on TripAdvisor. We operate in the idyllic heather strewn valleys and gushing ghylls as well as on the mountains and cliff faces of the breathtaking Lakeland fells. Our aim is to inspire and instil a love and respect of both the great outdoors and the adventure it offers. 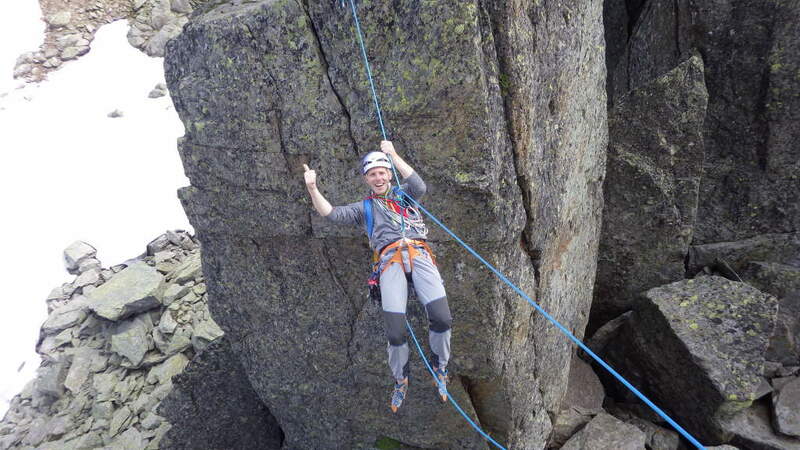 Whether you wish to scale a rock face, scramble up a gorge, climb a waterfall, slide or jump your way down a mountain into pools of water, abseil or just climb a mountain, you can find it all here. 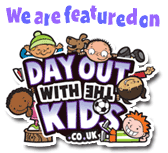 Just choose from our list of fun activities. I guarantee we wont be beaten on quality. We go longer than everyone else and provide better equipment i.e. wetsuits when ghyll scrambling. Our activity range caters for most fit and able persons from the age of 10 years and above. All children under 18 must be accompanied by their OWN parent or LEGAL guardian. We run activities for all adult or family groups from stag & hen parties through to families, groups of friends and even individuals. We always tailor the activities to meet the requirements of the group/individual and above all we will ensure you "Conquer the Great Outdoors" and leave us with memories that will last forever. Our van is packed and we are ready for a weeks holiday in Chamonix. With the ferry booked we set off with plenty of time to allow for traffic problems/ toilet breaks during the epic 8 hour journey. Things are going swimmingly (surprisingly) and we arrive 2 miles from the docks with an hour to spare for check in. Then, suddenly we are in a queue of traffic! A quick Google check and we realise there is a 2 hour delay due to French border control checks. We are stuck in a stationary queue until we manage to get through passport control at 1.20 am, 3 hours after arriving! 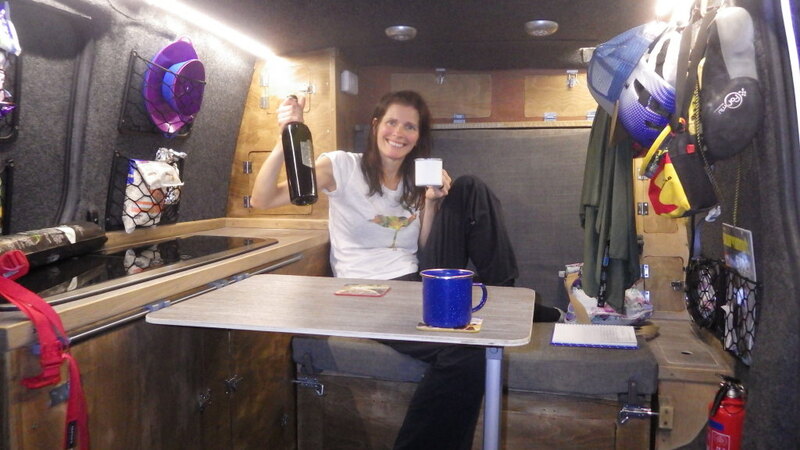 Luckily for us we played cards, made a cup of tea and had a pot noodle whilst waiting in the comfort of our van. I did feel sorry for everyone stuck in their cars with their legs cramped up with kids to keep occupied, especially as they kept announcing over the tannoy for everyone to remain in their vehicles. I felt guilty in a smug sort of way really, I almost shut the curtains out of embarrassment! We arrived in Dunkirk at 4 am and drove for just over an hour before pulling over to sleep for a couple hours. We then take it in turns to drive and get to Chamonix at 6 pm- hooray at last! Our old free parking spot is now pay and display so we manage to find different one before cooking tea and settling down to sleep. We’re up early the next morning for our first climb on L’Index and are on the first cable car up at 8 am. We then have a 10 minute chairlift ride before we reach our destination to climb SE ridge (AD 4c). We rack up and make our way over some compacted snow to get to the base of the climb. There are a group of 4 English people already at the base and they tell us to go ahead of them as they have to share their rope between them for the abseils. They also give us an ego boost by saying they thought we were guides approaching as we were moving fast (no one has ever mentioned ‘moving fast’ in the same sentence as me before! I must of been trying not to lose Craig). Craig starts up the first pitch with no bother and soon I’m seconding followed closely by one of the English lads. A few people are starting to appear at the base of the climb so we were lucky to get on it when we did. There’s quite a few loose boulders, Craig went to pull up on one that visibly moved so he decided to avoid that one! We put our rock shoes on for this route as we didn’t know what to expect for our first route of the holiday. As it happens we would of been ok in our B2 boots, but no harm done. A few pitches later moving at a decent speed and we are at the abseil spot. As we reach it we are followed by 2 French men, they must of overtaken the English group at some point. The first abseil is around 25 meters followed by another 15. As we finish the last abseil we land at the end of the snow line in the gully. We’re keen to get out of the gully amongst the debris of fallen boulders and so we pull the ropes down before walking back down to the chairlift area. Not before I spot a pair of sunglasses amongst the rocks, bonus! Just a small scratch on the lens but otherwise undamaged. Once there we sit outside a cafe that overlooks the Mont Blanc Massif range to enjoy a glass of wine to celebrate our first route of the holiday! 15 minutes later the English group arrive with tales of being overtaken by people, it started to get really busy behind us on the route so I’m pleased they let us on ahead of them.We chat to them about routes etc before taking the cable car back down. We decide to go to the swimming pool in Chamonix when we get back down, mainly to have a shower. Craig manages to drive down a one way street the wrong way by accident just as the Gendarmerie (French police) are coming head on towards us! Luckily they are very laid back and just gesture us to turn around! We get to the pool and Craig’s keen to show how fast he can go down the slide (I thought we left the kids back home?!) I can tell when he’s coming down the slide when I see an outline of someone tearing up the sides at speed before he lands in the water nearly emptying the pool! Unfortunately he’s managed to cut his elbow deeply on the slide and has to get some bandages on it. He’s advised to get a couple of stitches when the blood immediately seeps through, so we leave the pool and head back to Chamonix for supplies before having tea in the van. The first injury of the holiday, and it has nothing to do with climbing! 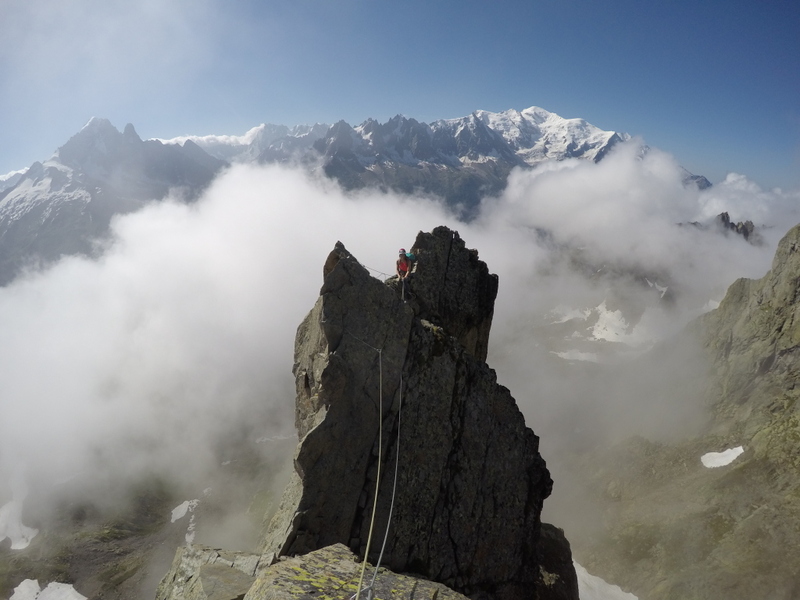 Next morning we are up early again ready for our next route of the day, Clocher – Clochetons Traverse (AD 5a). We pull into the Brevent cable car station just as a car pulls up beside us with some familiar faces in- it’s the English group again! We laugh at the coincidence and end up sharing the cable car with them. The walk in for this climb is an hour, and as it’s very misty it ends up being tricky finding the start of the route. After a couple of wrong turns we all arrive at the base of the climb- 1 hour 15 mins later. Craig sets up the first pitch and is unsure whether to step right onto an exposed arete. 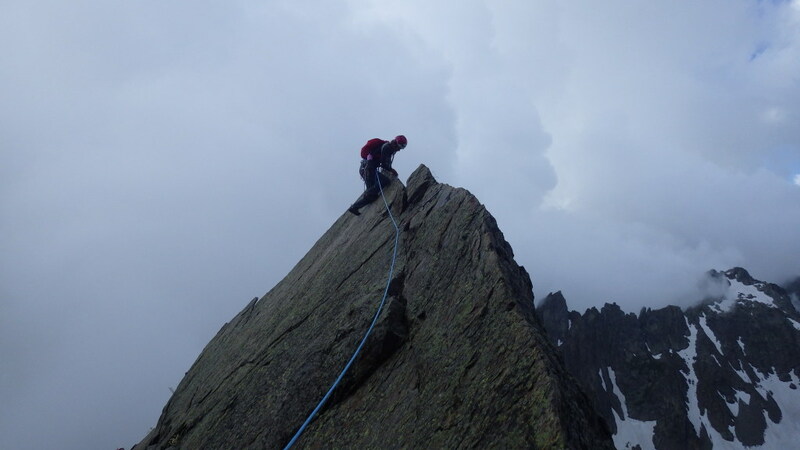 After some reading of the guidebook by Adam who shouts up the description to Craig, he steps around the arete and finds the bolt to clip onto. The pitch then traverses right again and up a crack. I join Craig at the belay ready for the first 25 metre abseil. It’s fairly awkward as it’s such a narrow gully, then it’s an easy short climb to reach another abseil that descends to the start of the 1st Clocheton. 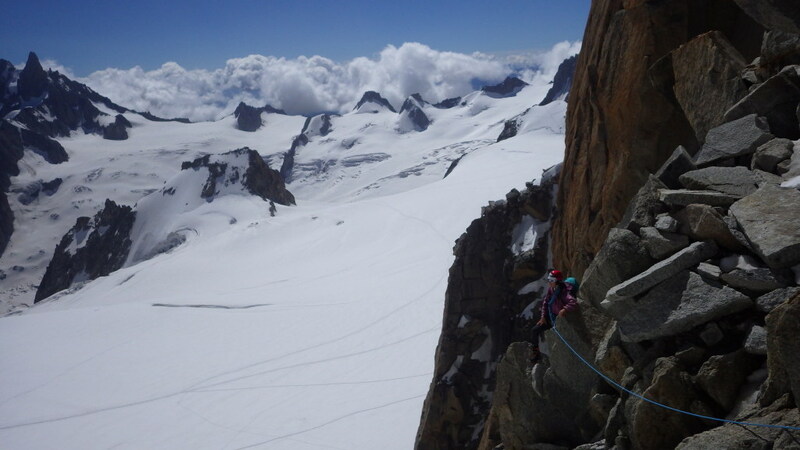 The next pitch involves climbing a steep crack , a great pitch that leads to the tyrolean crossing! Brilliant fun, Craig takes 3 attempts to lasso the anchor at the other side so we can make it over. It’s only about 5 meters wide so you suddenly arrive at the other side and need to haul yourself up and over onto the ledge. Adam and Rachel (one half of the English group) arrive at the tyrolean crossing and have four attempts of lassoing the anchor before I help ever so slightly and flick their rope over the anchor, it was close enough! 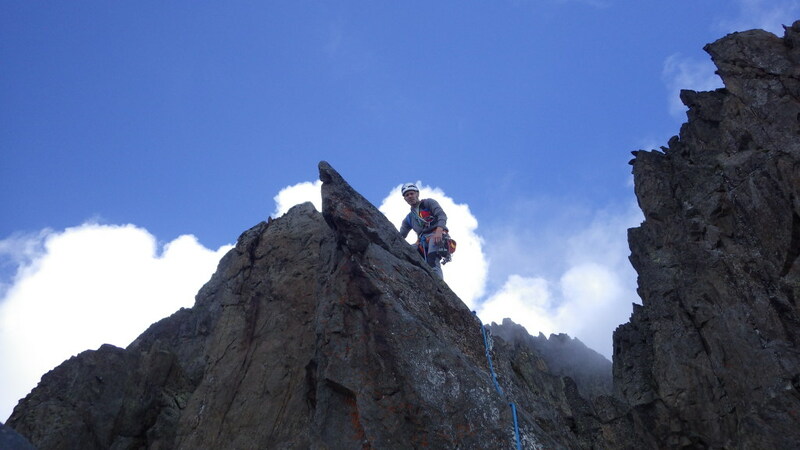 The next pitch leads to another abseil, 20 ft down the North face to reach the final chimney pitch. It’s strenuous but short lived. I don’t know if there’s a graceful way to climb this but I didn’t find it, luckily no one was watching! 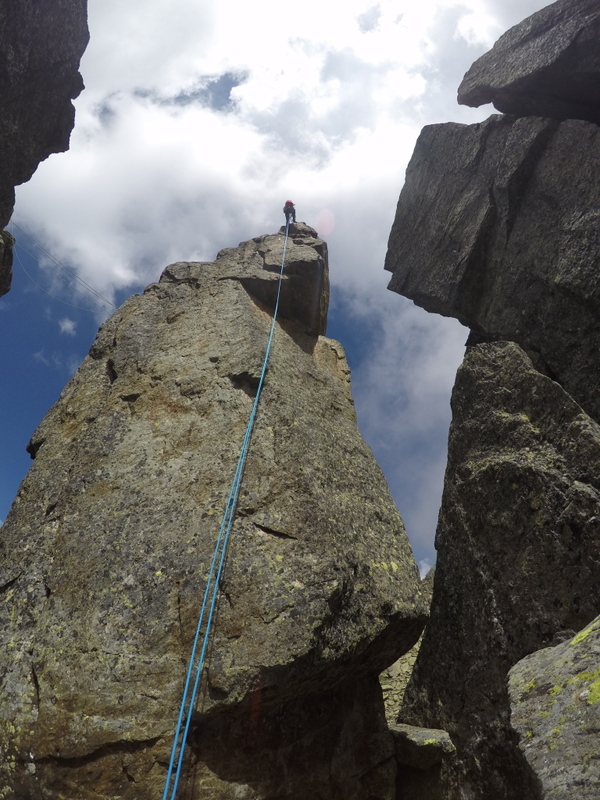 We abseil off and end up scrambling down an awful grassy rocky gully that seems to go on forever. The mist has gone now and we are able to see the path and cable car. After around 40 minutes and a few slips we stop near the cable car and eat lunch on a boulder. We continue to the station and have a drink before we go to get on the cable car. Yet again we bump into the English group who are just walking back down! They missed the final chimney pitch out and decided to ab off and start to walk back , but went a bit off track on the way. We have a joke with them about seeing them again tomorrow, but as it happens we didn’t see them again. We were lucky to do that route and be the only group on it, I imagine the misty weather might have put people off an early start. It certainly felt eerie in the bad visibility with no one around, especially when we heard a loud rumble of thunder. We go back to the pool (but Craig stays off the slide this time) and we have a shower and swim before going for a bottle of wine in one of the pubs. Up early the next day, the route we had decided the night before to do was Chapelle De La Gliere (D 6a). It’s 13 pitches long so we have to keep a fairly fast pace to make sure we finish it before the the clouds and evening rains come later that day. The walk in from the cable car is a descent this time and after a 40 minute walk we arrive just behind a British Mountain Guide with his two clients. There is already two French men on the route, the man seconding is really struggling and there is a fair bit of shouting back and forth between him and his partner. I can see his legs shaking- the dreaded Elvis leg when you can’t stop your leg from shaking during a climb! The BMG assures us/his clients that the pitch is ok, and he makes light work of it when he comes to climb it. After his two clients are up also, Craig sets off. He climbs it easily and I’m relieved after seeing the man in the first group! It is quite awkward to climb, Craig seemed to climb the face but I end up having to use the crack to lay back on. I edge my way up until I reach Craig at the first belay, it’s polished and there is a point where my foot slips a little so I know how the French man with the shaking legs felt! We keep pace behind the guide, which is comforting to know we aren’t going off route. The fourth pitch looks quite intimidating to me, as Craig starts it I can hear a foreign man repeatedly shouting ‘ Michelle’, ‘ Come on Michelle’ etc. I look around and notice someone that has come up from a different side to us and is clearly keen to get his partner moving. We have lost the guide at this point and continue on the route until we get to the ‘razoir pitch’. You have to stand on a spike and make a move upwards before traversing rightwards. Craig loves this pitch and rightly tells me I’ll hate it! 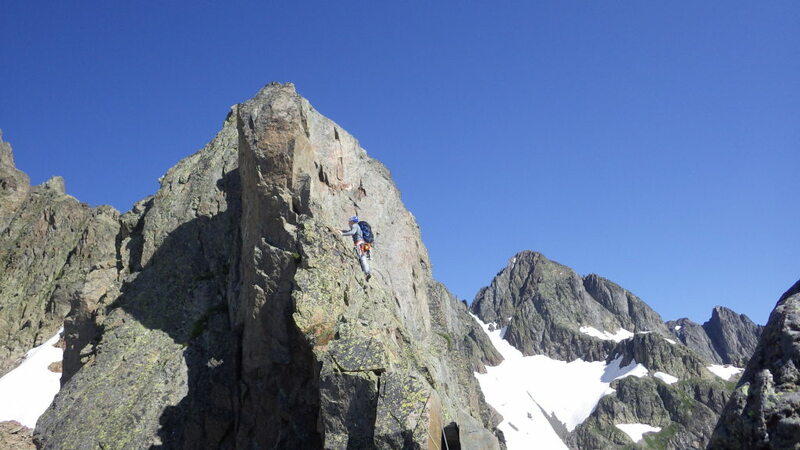 I’d rather be on little crimps than an exposed ledge where I have to traverse across. It doesn’t matter how easy the moves are, my head is screaming ‘don’t do it, look at the drop!’ I make the moves upwards and onto the traverse fine before falling to pieces and hugging the top of the rock unable to move! I resemble a dying fish flopping over the top of the ridge. Craig is hysterically laughing, rightly so as it’s quite pathetic. I even think I could straddle the rock and shuffle along as if I’m on a log. Craig’s probably getting bored of laughing now as he starts to offer some encouragement and advice. Naturally I don’t listen at first , I’m too busy being terrified. Then I realise I might be there for quite a long time so lean back and hand traverse along. Just in time too, as the man I heard shouting ‘Michelle’ has appeared in time to take a photo of me looking like a hero traversing across the ledge. I’m thankful he didn’t arrive 5 minutes before, or his photo would of been quite different. Not too bad after all, the ledges for my feet are all there in obvious places and to think I was full of dread before even attempting it because of the exposure! We carry on with a couple of pitches and are contemplating which way the route goes when the man from behind catches up again. It turns out he’s an Italian guide with an English client. We ask him if he know where the route goes and he says he’s unsure as it’s his first time doing it! That explains why he came up the wrong way, missing out the first couple of pitches. We hear her saying the start was dreadful, crumbly and insecure too. We go a bit too far right and get stuck in a gully filled with grass and boulders, we realise we should of been further to the left and I look over to see the Italian guide going up that way. We get out the gully and do the final couple of pitches, strenuous but good moves. I’m starting to feel really dehydrated even though I think I’ve been drinking enough. I clearly haven’t as I’ve probably had less than half a litre and we’ve been on the go for a few hours. We come across the English guide and his clients and stop to chat. The Italian guide is asking him for advice about the descent, where to go etc. We all set off at the same time, walking over rocky ground until we get to a place where we can abseil down further. I feel really unwell now and know I’ve got a water infection- great. We ab off and just as we’re crossing the snow back to the chairlifts, the heavens open. There was a 0% chance of precipitation apparently, but we were definitely getting soaked. Unfortunately this meant all the sightseers kicking around near the chairlifts decided they wanted to leave to go back down to valley level. So we join a queue for 20 minutes, I’m now shivering and wet and dying to get down. When we get back down we have to call a couple of doctors so I can get antibiotics, luckily I get an appointment for 6 pm as it’s now around 4 pm. The doctors prescribe me with antibiotics and we plan on taking it easy the next day. Eventually I adopt the right technique after I’ve calmed myself down! With the antibiotics starting to work the next day, Craig has been planning to change our rest day to a rest day until 6 pm! He’s been looking at doing a long snow/ice gully so we find the guides office in Cham and ask for some advice. 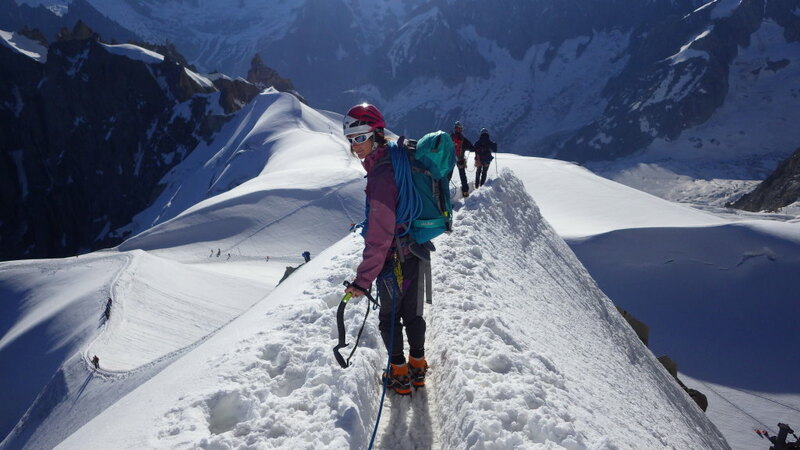 The route involves getting the cable car up from L’Argentiere then crossing a glacier, staying at a hut for the night then starting up the gully at 2 am when the risk of avalanche is low. The man in the guide office hasn’t heard of any problems recently and the forecast looks ok so we start to head back to the van to pack. After making sure we have packed everything required we wait until the last cable car is due. During this time a storm comes out of nowhere. It’s chucking it down and it doesn’t look very inviting high up. We decide to call the hut to ask about conditions there, he confirms if we were to be heading to the hut we would have to be quick as the visibility is deteriorating. We decide it would be a bad decision to head up in these conditions so abandon our plans. I’m still feeling drained even though the antibiotics are clearly working so it’s probably for the best. 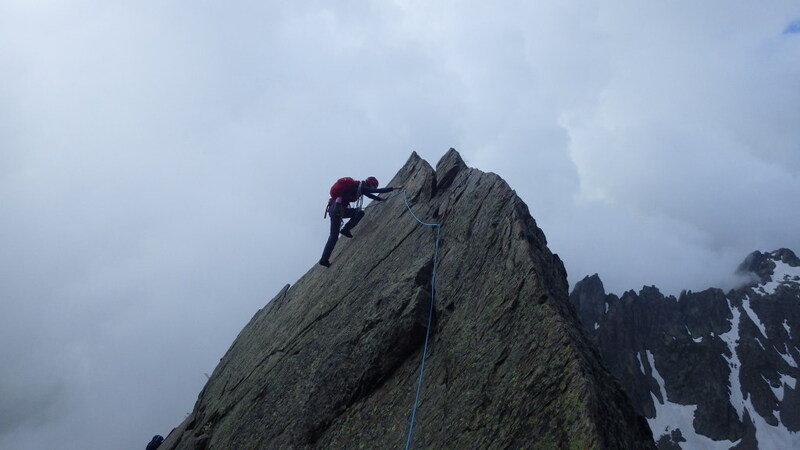 Instead we decide our last day in Chamonix will be spent climbing the Cosmiques Arete (AD 4a) again. We did this route a couple years earlier in May when it was in full winter conditions so it was going to be interesting to see what it would be like in Summer. Early start again and we arrive at the Midi station ready for the 8 am cable car up. It’s heaving, a mixture of tourists, skiers and mountaineers are in the queue. Craig suddenly thinks he’s left the camera in the van so he leaves me in the queue and darts off to check. Of course the queue starts to move and the barrier goes up and he’s still not back. I move forward until I’m at the front, he’s still not back so I have to let people go in front of me then I see him running through the station. Just in time as we are the last two people allowed on the cable car! The cable car on the Midi isn’t much fun if you’re claustrophobic, you have to stand for roughly 20 mins as it moves up the mountain whilst you’re squashed in amongst everyone. Half way up it lurches and swings, everyone falls slightly to one side and one lady starts to cry on the shoulder of her partner. I don’t remember it happening last time but apparently it did! We approach the station so I tap the crying lady on the shoulder and point it out so she knows it’s nearly over. When we arrive at the station we get out and make our way to the ice tunnel. Last time we came here I was faffing on coiling the rope, this time I’m struggling to get my crampons on and we both start making a hash of sorting the rope out. The altitude has defeated us again on the Midi! Finally we are ready to step out onto the ridge. We are blessed with another great day, it’s overwhelming to be surrounded by such a spectacular mountain range. The snow isn’t as consolidated as when we last came, as it’s Summer it feels more crumbly and slippy. I take care making my way down the ridge, probably a bit too cautiously but when the worst is over I pick up speed and we move across the glacier. Last time I saw no visible crevasses but this time we step over a few small ones as we make our way to the hut at the base of the climb. There is a party of 5 at the base, we stop to take a layer of clothing off and have a drink and head up after them. The route looks completely differently this time, there are large exposed boulders instead of snow. We used two axes from the hut going up last time on snow and now we were mainly on bare boulders with some snow in between. People start coming out of nowhere, the route was clearly going to be busy. A group of 3 Germans say they will go ahead of us as ‘We are probably more acclimatised’, we aren’t bothered but we then end up overtaking them again shortly after. The first abseil station is chaos, a big queue so we wait patiently until it’s our turn. As we start to abseil there are some people soloing down at the same time, it’s all a bit of a nightmare. At the second abseil the group of 5 we saw at the start are taking forever, it seems like there is one person taking 4 novices. Everyone behind is getting impatient but they aren’t in any kind of hurry at all. 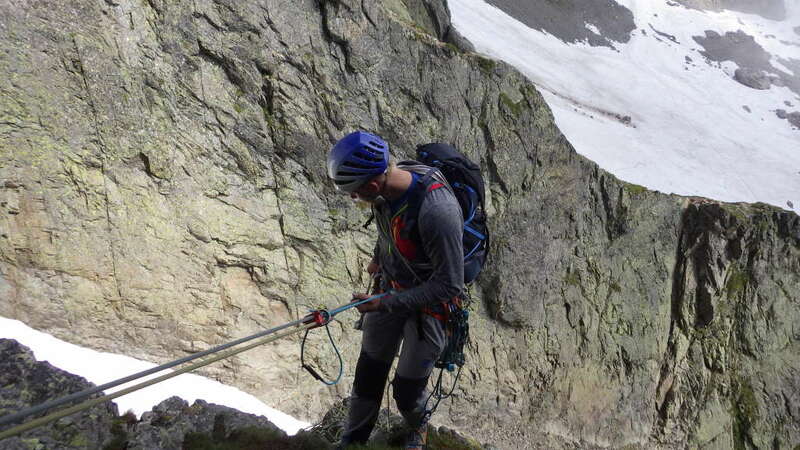 We are followed down the abseil by a French Mountain Guide and his client. He mentions how the weather conditions have been terrible until recently so he hasn’t been out much this year so far. This is his clients first climbing outing and he tells me he’s very nervous and exhausted but having a good time. He’s behind us on the next pitch then takes a lower path to Craig on the one after, so they end up ahead of us. Craig has continued around a corner and I’ve just started to climb, when there’s an almighty rumble. I turn and look behind me to see huge rockfall coming somewhere where the second abseil spot is. There are a few huge boulders smashing down the side, I’m stood transfixed until I realise Craig is shouting frantically. I shout back that I’m ok (a few times as I’ve got a quiet shout and he can never hear me!). The guide beside him sees me coming round the corner and tells Craig I’m ok too. When I reach him he says he felt sick because he thought I might of been caught in the rock fall, especially when he couldn’t hear me shouting back. 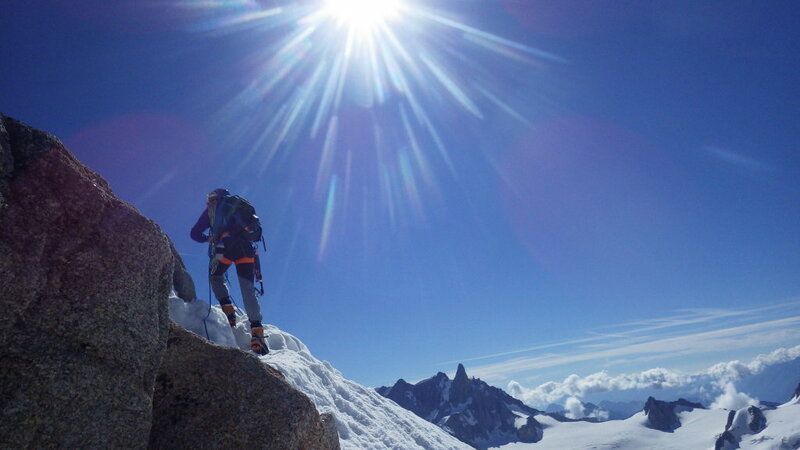 We just want to get out of here now, so hurriedly keep moving until we arrive at the crux. There’s a small queue, the guide and his client have managed to get on before a group and we have nothing to do but wait…..and wait…..and wait. The group of 5 that were taking ages on the abseils are now on the crux pitch, getting hauled up and having massive amounts of instruction whilst on the ledge! They are tangled up in the rope and it just seems to be going on forever. The most concerning thing is since the rockfall not one single person has come around the corner after us. Considering how overcrowded it was on the abseil points we can only assume everyone retreated after the rockfall. We are there a good hour waiting for the group of 5 to finally disappear so Craig can get on the crux. Just as they are about to we are joined by a few more people who appeared from a different way to us. As I go up the crux and stand on the small ledge the man in the group of 3 behind me starts to climb. Now he has positioned himself squashed behind me on the ledge and is starting to bring one of the other men up. Luckily Craig says I can climb before he manages to get to us as I don’t know where he thought he was going to fit. We are now at the bottom of the final chimney pitch waiting again for the last two of the group of five to climb. I only wish I had stopped the leader from climbing between me and Craig but I’ve never encountered that before so I was shocked that someone could think that was a safe thing to do. It’s one thing taking over people, asking if you can go past or passing by together safely if possible but not this kind of impatience and on the last pitch too! It takes a lot for me to raise my voice at all never mind shout, but after we had waited patiently three times for the group in front for this to happen at the end annoyed me. I get to the top and Craig tells me to keep going until I get to the ladders up to the midi station. I get there just as the Italian leader is desperately trying get ahead of me again for some odd reason. I climb the ladder followed by Craig and this time the viewing platform is teeming with sightseers. It was completely empty last time with the door frozen shut as Craig had to bash it open with his axe so we could get in. This time some people take our photo and a family from Liverpool ask if their son can have his picture with ‘mountaineers’ haha! It’s the most bizarre way to finish a climb that’s for sure. Craig is now really suffering from altitude sickness and is crouched on the floor whilst we wait to get on the cable car down. We were planning on looking around the museum before going back down as we didn’t last time, but Craig just needs to get back down. When we get on the cable car a couple of people ask if he’s ok as he’s sitting bunched up on the floor with his head in his hands! Annoyingly for Craig I feel great even though we haven’t eaten and probably haven’t drank enough (again). As soon as we’re down on ground level he starts to feel better so we head to the cafe for a coffee over the road. 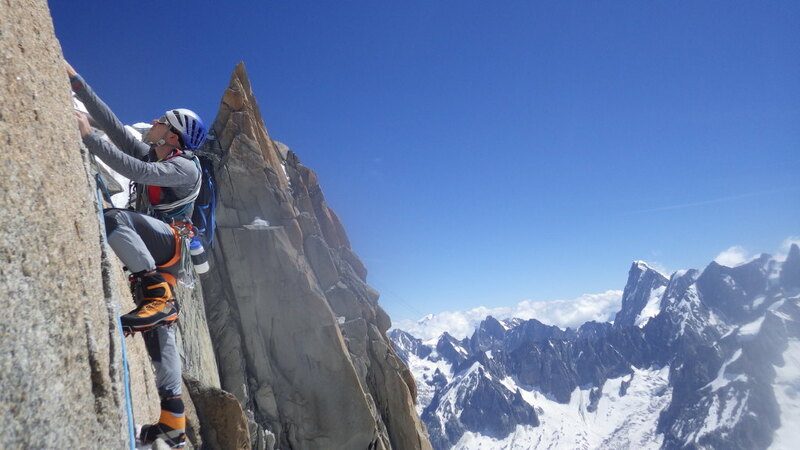 I really enjoyed the Cosmiques Arete the first time in winter conditions, I felt the climbing was more interesting and it was more of an adventure. This time with the rockfall and the crowds was enough to put me off from doing it again in Summer. 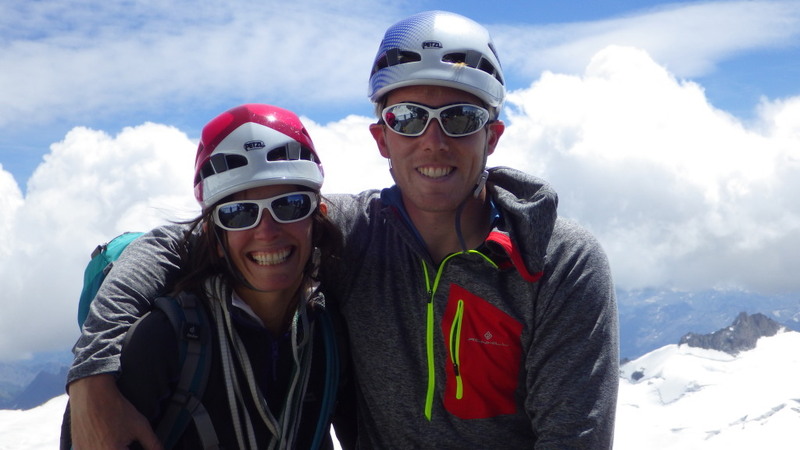 That night we had a meal out in Chamonix instead of in the van and celebrated a successful climbing holiday with decent weather conditions and no injuries. Well, apart from the incident on the swimming pool slide…. Crags Adventures © 2019. All Rights Reserved.